A boiler may be defined as a closed vessel in which steam is produced from water by combustion of fuel. Boiler is used in many industries such as in steam power generation, in sugar industries, in textile industries for sizing and bleaching etc. and in many other chemical industries. Earlier it was mainly used in power generation in steam engine. 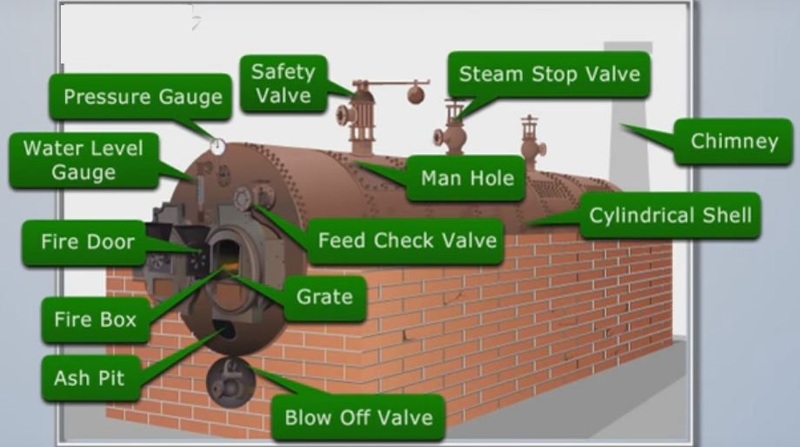 Boiler is also known as steam generator. The primary requirement of boilers is the water, which must be contained safely and the steam must be safely delivered in desired condition. Boiler may be classified in following types. If the axis of boiler is horizontal, it is known as horizontal boiler. If the axis of boiler is vertical, it is known as vertical boiler. The main advantages of vertical boiler that it is easy to maintain. If the axis of boiler is inclined, it is known as inclined boiler. If the furnace is outside of the boiler shell, it is known as externally fired boiler. If the furnace is inside the shell, it is known as internally fired boiler. If the boiler pressure is above 80 MPa, the boiler is known as high pressure boiler. If the boiler pressure is below 80 MPa, the boiler is known as low pressure boiler. 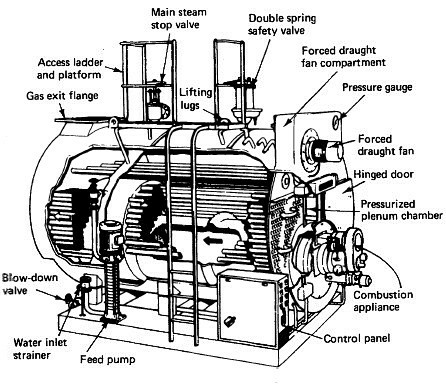 If the circulation of water is done by a feed pump, the boiler is known as forced circulation boiler. 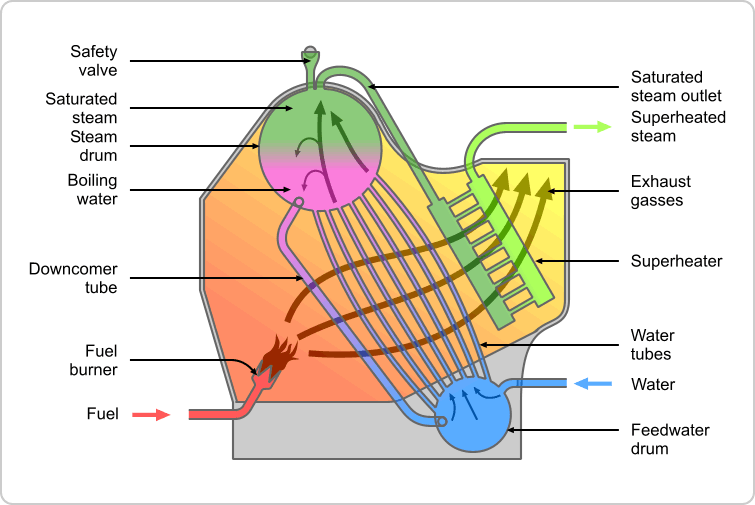 If the circulation of water is done by natural convection, this is known as natural circulation boiler. In this types of boiler water flow surrounding the tubes and the hot flue gases flow through the tubes. The heat passes form the tube to surrounding water which is used to heat the surrounding flowing water and convert it into steam. In this boiler, water flow through the tubes which are surrounded by hot flue gases. These flue gases used to heat the water and convert it into steam.